Guess the correct number of ornaments on the tree. Can you count the ornaments on the 2018 Birch Ridge Inn Christmas Tree??? But now comes the "Fun" part or the year. The 2018 Birch Ridge Inn Christmas Tree is officially on display. This years tree is the "Family" tree decorated with multi-color lights and traditional glass ornaments. The tree measures in at just over 13 1/2 feet from floor to ceiling. And of course, as the 'Family" style tree demands, there is tinsel everywhere! It has become a Christmas Tradition at the inn to have our guests and many locals come and have their pictures taken beneath the tree. For the second year in a row, we are having a fun contest around the tree. Last year we counted lights. This year, instead of lights, we are counting ornaments. The rules of the contest are very simple. Just visit the inn and fill out a contest entry form with your best guess. Using "Price is Right" rules, the person who guesses the closest to the correct number of ornaments on the tree, without going over the number, wins. You can fill out your entry form any day during the holiday season, right up to 9:00 PM on Friday January 4th. The winning entry will be announced in the Great Room on Saturday January 5th at 6:30 PM. No purchase is necessary and you do not need to be in attendance to win.... but you must come to the inn to get your entry form to enter the contest. The prizes are simple. The person guessing the correct number of ornaments wins a Champagne dinner for 2 at the inn. The runner up, wins a $50 gift certificate. Last years contest featured lights. There were 4137 total lights on the 2017 Birch Ridge Inn Christmas Tree. Ignigo Salazar was the closest with a guess of 4100. 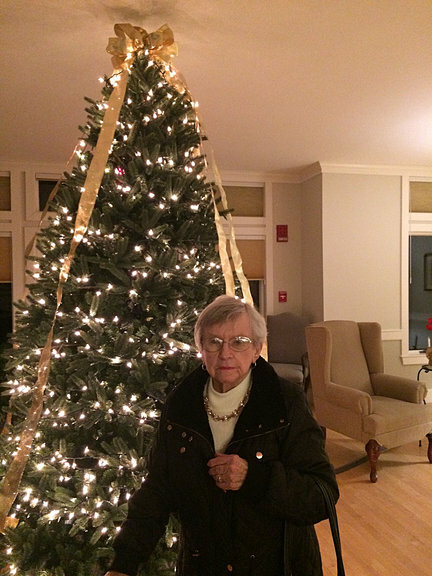 Peggy Golonka came in as the runner up with a count of 4080 lights. While we have been busy getting the inn ready for the holidays, we have taken a few hours out on the mountain enjoying mid-winter conditions. 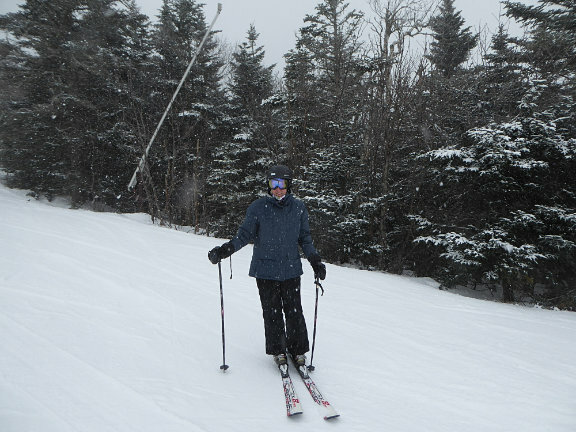 Killington has thus far been blessed with multiple feet of snow in late November and early December. Last weekend, virtually the entire resort was open for skiing and riding; certainly something we have not experienced in a while. Mary taking a break from making her turns on the mountain. Finally one big shout out to a special lady. Mom turned 90 years old last week. As feisty as ever, I was down on Cape Cod for several days to mark the occasion with my brothers and sister. With the cold temperatures yielding ideal conditions for the resort to continue to make snow; skiing and riding should continue to be great as we lead into Christmas week. If you are planning a trip to the Green Mountains during Christmas week, you will not be disapointed. Who could ask for anything more! It has now been snowing for 3 straight days. Starting late Monday, the Killington region has been blanketed with well north of a foot of fresh snow. The snow is of the heavy wet variety. Sierra Cement versus Champagne Powder. But with the possible exception of the amount of effort required to remove it from some surfaces, the snow is just great at the resort to lay down a solid base for the ski season. The resort is expanding terrain at a breakneck pace, keeping up with the bounty given by Mother Nature. In addition to K-Peak, and Snowdon, Rams Head opened today for lift serviced skiing and riding. Superstar, site of last weekends Audi FIS World Cup is scheduled to open to the public tomorrow. Needles Eye is very close. And rumors are spreading about Bear Mountain. Truly incredible to have this much open terrain in late November. At the inn we are busy getting ready for weekend skiers and riders, and decorating the inn for the holidays. 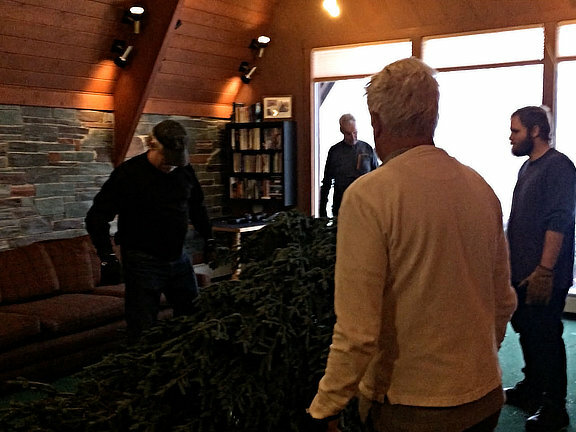 The 2018 Birch Ridge Inn Christmas Tree was raised in the Great Room on Tuesday. The "Official" public ceremony to light the tree will take place on this coming Saturday December 1st at 6:30 PM. Assuming I can get away from my snow blower for a couple of hours (thats a good thing by the way not a complaing) , we are planning on taking a break from work to take some runs on the mountain tomorrow. We will report back then on conditions so you can prepare for your weekend escape. "Be Fast & Be Fearless"
The Killington Resort is "Fast and Fearless". This week is what it is all about. Killington once again will take center stage in the ski racing world with the Killington Cup; a highly favored spot on the Audi FIS Ski World Cup Tour for female ski racers. It is truly hard to moderate the excitement that the event brings to the area. Killington has re-invigorated ski racing in the north east with their technical abilities to make snow in November. And the ski racers, the crowds, and the media are all converging once again to participate in the party at Killington over Thanksgiving Weekend. For the third year in a row, Mother Nature has provided Killington with cold temperatures to allow the resort to offer "Superstar" to the best female ski racers on the planet. And this year, Mother Nature had a bonus. Unlike last year when media had to be a little careful with their camera angles, this year everywhere you turn there are mountains of snow. The fastest female ski racers on the planet in the Slalom and Giant Slalom will ski with a backdrop of mid-winter conditions on every turn. But don't let the party put a damper on your personal ski adventure. Killington will have the most open terrain on the east coast available for skiers and riders this entire week. Snow flurries, snow showers, and an outright snow storm are in the forecast for Killington this week, allowing the resort to continue their efforts to build open terrain. Currently Killington is offering top to bottom skiing and riding on the Killington Peak side of the resort. In addition to the early trails opened in the North Ridge area, Killington has also brought online skiing and riding in the Canyon area including Lower East Fall and Cascade, in addition to skiing and riding on Snowdon on Highline, Great Northern, and Lower Bunny Buster. Killington's summer infrastructure work is coming online. The new cabins are being put on the K1 gondola. Initial reports have been very positive for guests who have ridden them. The first tunnel on Snowden is also opened. This should radically change skier congestion during busy periods at the resort. Work is continuing on the new Snowden Six-Pack. While it is not going to be operating over Thanksgiving, the resort is making comments locally that it will be brought online the last week of November. We will see if that happens due to the test schedules required to certify new lifts, but the message from the resort is very positive. It certainly will be available in December to support growing crowds of skiers and riders as the winter season builds. If you would like more detailed information about the Killington Cup, the resort has extensive information online. I found the Fast and Fearless to be especially motivating with the short video clips from locals preparing from the event. If you can get to Killington this Thanksgiving, you will be rewarded in many ways. From the excitement of World Cup ski racing to exposing your inner beast to the challenge of personally skiing/riding Killington, it will be a weekend to remember. Where ever you may be, give thanks and Think Snow! In what is a good omen for the Thanksgiving Holiday period and the World Cup at Killington, heavy snow blanketed the area last night into the morning hours. 3 inches of heavy, wet, snow fell around the inn, bringing the total at the Birch Ridge Inn snow stake to just under 6 inches. With cold weather and more snow in the forecast, it looks like the region will be set up nicely to celebrate Turkey day in style. Wherever you may be, Think Snow! First snow of the season blankets the region. Killington Resort set to open for skiing and riding Friday October 19th! The Birch Ridge Inn; waning fall colors backed up with a skim coat of snow! Thursday. October 18, 2018. The season is flipping. Overnight the area was hit with the first snow storm of the upcoming winter. Starting with heavy sleet, the precipitation changed to heavy wet snow, blanketing the inn with a couple of inches. Plummeting temperatures through the night froze the snow solid this morning, forcing anyone attempting to drive to search our their ice scrapers to clean windshields. Ah... the joys of winter. The Killington Ski Resort announced yesterday, with the snow storm imminent, that they would be open for skiing and riding for passholders only on Friday October 19th (tomorrow). Snow making operations are in full swing on the mountain today, as temperatures are struggling to get much above the freezing mark at lower elevations. Lifts for pass holders start turning Friday at 10:00 Am. Skiing and riding for the general public begins on Saturday. Where ever you may be, enjoy the change of seasons. Wear sun screen if you must. But we are thinking snow for the mountains of Killington. The Birch Ridge Inn; bathed in fall colors. Thursday. October 4, 2018. The Killington Resort from Superstar thru Snowdon, Thursday, October 4, 2018. Fall Foliage colors are starting to pop in and around Killington. A colorful weekend is on tap in the Green Mountains. And wherever you may be, get out and enjoy the change of seasons. The race is on between the Killington Resort and Mother Nature. Dark foreboding clouds veiled all of the construction activity taking place at the resort today. From ski tunnels to new lifts to lift storage buildings, the resort is crawling with teams of workers moving about with equipment ranging from simple shovels to heavy equipment and helicopters. The scene in the K1 parking lot in the picture below illustrates some of the scope of the activities. The new support barn for the K1 Lift is clearly visible in the background on the left of the picture. In the foreground left, you will see lift components for the new Snowden Six Pack. Construction trailers and the Snowden Six Pack base components span the middle of the frame with various large pieces of conduit. To the right of the frame, the Helicopter to be deployed to install the lift towers at Snowden and South Ridge sits grounded by the cloud cover. To the far right, workers are moving iron components around. Unseen are the large dump trucks hauling dirt and stone everywhere. It is truly a full blown ballet that is taking place on the mountain to coordinate all of the activites. The K1 parking lot has turned into a massive construction staging area. -Refurbishing the K1 Gondola including a new haul line, and new cabins. -Re-installation of the Snowden quad to the other side of the resort on South Ridge. The race with Mother Nature towards winter is on. Wherever you may be, get out and enjoy the end of summer and the early fall season...Snow will be here soon enough!